Canadian rock legends RUSH will be in the national spotlight on ABC-TV's hit comedy "Schooled" on Wednesday, April 10 at 8:30 p.m. In this all-new episode, character Johnny Atkins, who always wears a RUSH concert T-shirt, shows his love for the band in a new way. In "Schooled", Johnny is working at William Penn Academy as a custodian and reflects about his time in high school working at his school's radio station. He claims he put together a show called "Rush Hour", featuring 30 minutes of the greatest band in the world, RUSH. "Schooled" is a direct spinoff of ABC's long-running '80s comedy "The Goldbergs", where the Johnny Atkins character is a regular. 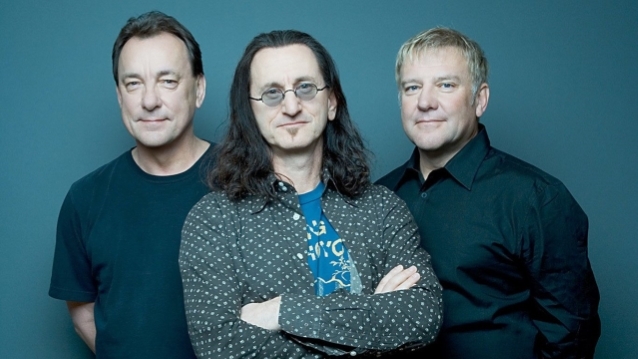 RUSH has been completely inactive since completing the "R40 Live" tour three years ago. Drummer Neil Peart was battling enormous physical pain through much of the trek, including a foot infection that made it agonizing for him to even walk. A few years ago, guitarist Alex Lifeson told Rolling Stone that he receives injections for psoriatic arthritis. He was previously hospitalized for anemia from bleeding ulcers and suffered breathing problems. Lifeson and bassist/vocalist Geddy Lee have repeatedly said that RUSH will never do a show unless all three musicians agree to take part. They haven't performed as RUSH without Peart since he joined the band in 1974.